Let’s be done with 2017 already and fast-forward to next June to the best movie of 2018: Ocean’s 8, of course. Last week brought us the first official poster for the Ocean’s sequel/spinoff and today we have the very first footage. Admittedly, the teaser is just a short 15 seconds, arriving ahead of tomorrow’s first full trailer. But every bit of it is great. There’s Cate Blanchett and Sandra Bullock munching on some pierogis at Veselka, which sounds like the brunch date of my dreams. There’s Rihanna clapping a pair of tongs, a wide-eyed Helena Bonham Carter eyeing some gorgeous jewels, Sarah Paulson possibly shopping for a new Kerig, Anne Hathaway slapping some dude, Mindy Kaling inspecting more jewels, a brief look at newcomer Awkwafina, and then Blanchett and Bullock lounging in a bed of cash. 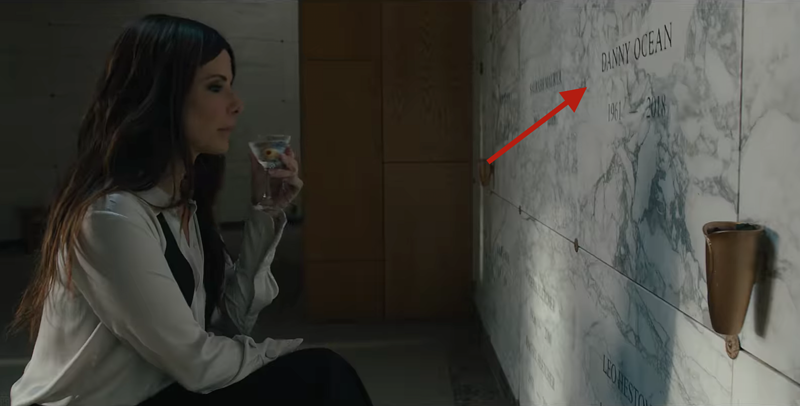 And wait a minute, did you spot the name on Bullock’s toasting on that columbarium wall? Yup, Ocean’s 8 apparently killed off George Clooney’s Danny Ocean. The Steven Soderbergh-produced sequel, directed by Gary Ross, is all about Danny’s sister Debbie Ocean (Bullock) who plots a heist at the Met Gala – you can briefly spot Blanchett’s character eyeing the seating chart in the teaser. But is Danny really dead? On one hand it’s pretty hilarious the spinoff nixed the previous trilogy’s male lead and made way for eight new women. But I also take Danny as the kinda guy who’d fake his own death. There’s no word on whether Clooney will appear in the film, but Matt Damon, Carl Reiner, and Elliot Gould are all expected to return. Ocean’s 8 will also feature Dakota Fanning, Olivia Munn, Katie Holmes, Richard Armitage, James Cordon, and Hailey Baldwin. Stay tuned for a longer sneak peak tomorrow.